BOGOTA (Reuters) - U.S. civil rights activist Rev. Jesse Jackson accepted a request on Saturday by Colombia's FARC rebels to oversee the release of a former U.S. Marine they kidnapped in June while he trekked through a known guerrilla zone despite warnings of the risks. "We accept this obligation and opportunity to render service to Kevin Scott, his family and our nation," Jackson said. "We have made contact with the State Department urging them to contact as quickly as possible the nearest of kin of Kevin Scott because his release is imminent." 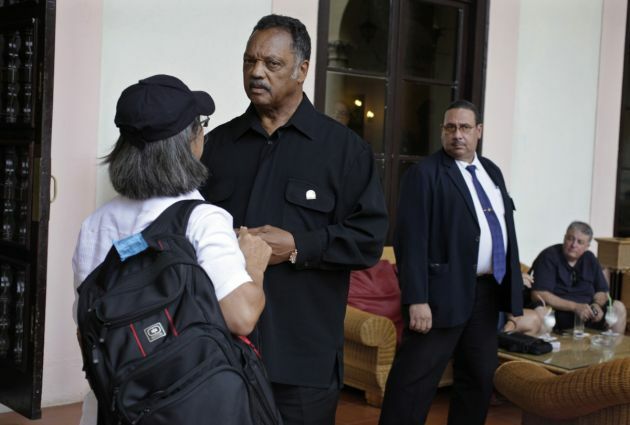 Jackson is on a private visit to communist-run Cuba that is being hosted by the country's Council of Churches. On a visit to Colombia 10 days ago, Jackson called on the FARC to release Sutay, a gesture he said would help peace negotiations with the government. In a statement on Saturday, the FARC said it wanted Jackson himself to assist with Sutay's release. Sutay, a veteran of the war in Afghanistan, was captured by the FARC after being warned by police to abandon his plans to hike through what they called a "red zone" for rebel activity. He had been backpacking through several Central and South American countries. The Colombian Revolutionary Armed Forces, or FARC, looked ready in July to release Sutay to the International Committee of the Red Cross. After initially describing him as a "prisoner of war," it hardened its stance and accused him of being a mercenary after President Juan Manuel Santos refused its demand that a leftist senator, Piedad Cordoba, oversee the release. Santos had also said he would deny the rebels the chance of making a "media show" of the hostage's release. Until its appeal to Jackson, the FARC had made no further mention of plans to release him. The FARC was set up in 1964 as a communist-inspired peasant army fighting to reduce inequality and redistribute land. Its numbers have been roughly halved by a decade-long U.S.-backed government offensive.